Cincibility | cincinnati, disability, possibilities, trials, triumphs, friendships, etc. After almost a decade on WordPress, Cincibility is moving over to Starfire’s website. We are so grateful to all of our followers who have kept up with our story over the years. It’s been a long journey, and we hope you’ll stay in touch. We’ll share updates from our blog in our newsletter, you can head to our home page to subscribe. Lots more to come, including new podcasts with stories told live at our BYOB(reakfast) and new conversations, videos, and events all centered on the possibilities of more in people’s lives. …What the next two days of the conference will look like is unknown! Well, not entirely unknown. We DO know there will be dinner each night, and lots of people from around the city sharing their gifts and passions. The rest depends on you taking the chance to be part of the most unique 3 days you’ll have in Cincinnati all year! 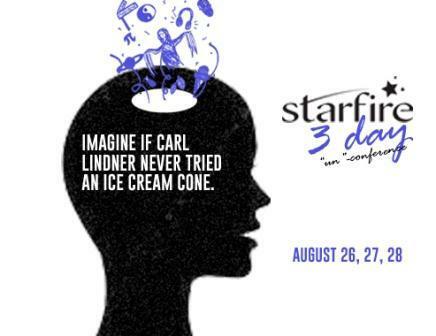 Imagine if Carl Lindner never tried an ice cream cone. That intriguing thought is put forth by Starfire, a local organization working to build better lives for people with disabilities, as it invites people to its third-annual Starfire 3-Day ”un”-conference. The free event starts off August 26 with a blank schedule, which is filled by guests offering classes and presentations on a variety of topics. Joining us to discuss the Starfire 3-Day, how it brings people together and helps fight the social isolation many people feel these days, are Starfire Executive Director Tim Vogt; Marketing and Events Director Leah Addison; and Board Member Megan Selnick. Katie: Can you start us off and talk about what does safety get sold as in the service system today? Actually what keeps us safe it’s not the locks on the doors it’s not the security systems it’s not the management requirements of the Medicaid system or the policies of the group home or the day program or the segregated farm that says they’re going to do this that or the other. None of those things actually provide true safety. K: Yeah, I mean if we all wanted to live in the safety that people with disabilities have to live in, which is the safety of basically the State and policies, it would look like a military state. You know, it would look like people going, patrolling up and down the streets and us having to lock our doors at a certain time and all of us being sort of trapped in this really sterile, scheduled out environment and nobody would want that. T: It’s always safer with more people. T: So that’s the design of Starfire’s work that’s intentional. That true safety comes from a form of love or a form of affection and care. It’s a shared obligation, it’s a reciprocal relationship. I look out for your best interest because I care about you. And you look out for mine because you care about me. K: So… in front of me is a book called christmas and purgatory and I’m going to read a quote. It says, “Some of mankind’s most terrible mistakes have been committed under the spell of certain magic words or phrases.” This book is filled with graphic and disturbing pictures of an institution. I’m bringing this book into the conversation because it shows us the worst of mankind of what can happen when we follow the lure of ‘safety’ over community. T: Well, the book Christmas in Purgatory has always been powerful to me because it is, as you put it, graphic. And it’s also kinda interesting, at least from my perspective, some of the pictures rhyme with the pictures I see even today. In services for people and in the form of our services. It’s not as bad, so that book shows people naked in rooms with dozens of other people without any kind of toileting or any kind of cleanliness. It’s a really horrific kind of doral kind of essay on what was happening to thousands and millions of people with disabilities. But if you took just the form of it, people in rooms without much purpose, you’d largely see that very much alive today. The same pattern is still happening in day programs and workshops and group homes for people with disabilities. That’s really, I think very dangerous because it’s almost like it’s repackaged, it’s the same pattern but it’s got some new color to it and then we buy it. We’re giving them a version of the Christmas in purgatory support system which is here’s some walls that will largely keep out the monsters that we’re telling you that live outside of here but they’re still sitting there in a room with each other doing nothing that leads them outside of those walls. We’re not in the presence of these safe, caring, loving glances. We are at the real kind of mercy of the wardens of the institution, so to speak. K: So are you saying that we haven’t designed anything really new out of the institution? We just kinda designed smaller, prettier institutions when we closed down places like Willowbrook? K: It seems like the intentions are maybe better this time around. And I don’t think that it’s bad to have a collaboration between service system and families and community. It’s for me, from my perspective, it’s over weighted toward just the services system and then a person with a disability almost gets kind of sent to this place or places that are gonna serve them and if it’s just to captivate them and keep them safe in our building, the shared purpose becomes clienthood. It becomes we all are in this building because we all have some sort of need that’s been defined by our medical records or our doctor’s evaluation. So volunteerism could be we discover purpose together as citizens and that’s what would build that kind of safety net of relationships that well I look out for you because I care about your purpose and I care that your gift to the world would be missing if you weren’t here. The biggest danger from my perspective is nobody’s talking about this. We say “it’s their choice to be segregated” and in that case let ourselves off the hook for even addressing the complexity of the issue. I think that’s why Starfire’s story is so powerful. It’s just more honest. We’re talking about the complexity of things versus selling everybody on the idea that we can solve all your problems. The most egregious examples I have of people with disabilities being in trouble is where there were very few people looking out for them. There was a woman who was being prostituted. She had $100,000 a year in services and the services couldn’t stop her from being prostituted. Another person I know lit a cup in fire in his group home and spent two years in State Penitentiary. He again, had a big waiver, big bunch of money behind him that the service system and a bunch of nonprofits, including Starfire. Both these cases lined up and said we’ll keep you safe. We had three people that I always kind of paired together that came to our dances and our outings. One young man’s mother shot him up with morphine then shot herself up. She’s still alive but she’s in jail for the rest of her life and her son is dead. Another young woman would come to our dances and our outings and her mom laid her down in bed and shot her in the head and shot herself in the head and both of them are dead. Another mother stabbed her daughter who was autistic and then stabbed herself and set the house on fire. All three of those people came to our outings and our programs. They all participated in our dances. They all went bowling with us. And I’m sure it’s more complicated than any of us know. But my question has always been did we fail them by not bringing in more people into that story? By telling them that our dances and outings were gonna answer all of their hopes and dreams and fears, did we take away the complexity and did we let ourselves off the hook for actually inviting in those capable glances that would have said, “Hey it seems like you’re not doing so good, could I spend an afternoon with your daughter or could you and I take a walk and just talk about it?” How do we grow a safety net of relationships – versus services? K: A safety net that looks more like love? Outside of the service system, outside of a volunteer saying, “Let’s go on an outing together and sort of not taking them as seriously as a true friend. When families can see that, ‘Hey my son or daughter is loved,’ that creates safety. T: I think that if I fear being rejected, it’s largely because I’ve had that experience before right? And we know that people with disabilities are rejected a lot of ways throughout their lives. So are their families and if we don’t acknowledge that. Then we ask the question of how do we mitigate against that rejection? How do we build less rejection? That would be really good work but to simply say we’re gonna protect you from ever having to worry about rejection doesn’t actually get at the antidote to rejection. It just takes away the possibility of the hurt coming. K: Let’s address the idea that people with disabilities often need support. Not every person with disabilities has the same needs or challenges but across the board there is a need for support that might look like a staff person, right? I think that what we’re saying here is not to say that someday that the community will replace every need for the service system. Is that right? T: I don’t want anyone to ever think that a friend is going to replace paid support or a friend’s gonna replace family. However, we can’t think the service system is the sole system of support. We have to believe that some people can learn ways to support each other outside of services. So for example, if someone needs a feeding tube, that might lay outside the technical expertise or even something that would be unsafe. We wouldn’t want me to change someone’s feeding tube, I could easily cause an infection or harm to that person. However, there are lot of things we could do together that don’t require me changing a feeding tube. The problem is services own every aspect of a person’s life. I always ask families, ‘Were you trained to have a kid with a disability or did they just fall into your lap?’ They say we just learned. So family members are just citizens that learned the role of caregiver, so that means other citizens can learn. I just don’t like discounting the possibility that citizens can learn these things. So services have to be more creative and individualized so they can consider each individual’s design question. What is the design question that arises from this person’s life? Or their purpose. How might we help support facilitate that is an individualized design question? They also have to assume that someone from the community should and could be in this person’s life in a variety of different ways and the service workers have to own their own limitations. K: One of the last quotes here in the Christmas at Purgatory book says, “The greatest discovery of my generation is that human beings can alter their lives by altering their attitudes of mind.” I think that is a big part of what we’re talking about. If we keep the same mindsets we’re gonna continue to pump out the same story, which is an old story of people with disabilities. K: How should people change their mindsets about safety? What is the sort of underlying thing you think that needs to just shift? T: I think they just have to start getting out there and meeting people. I think they have to start really believing that there are about thirty people out there that are going to be their future best friends that they haven’t met yet. And the only way to meet them is to start meeting them, and then the only way to get them to be best friends is to start investing in those people. And then just believe in it and act like you believe it and sure enough it becomes true. T: It’s complicated isn’t it? This story is part of our Story Series, “Work.” Subscribe and get a new story from Starfire in your inbox week by week! We broke out the question into a series of 6 parts, addressing the various aspects of work throughout. In the next part of the series, Jack took us into a day at his job at J&N, where he works in a large warehouse alongside people like Phil. This story is one about building relationships with co-workers as much as it is about matching the right skill sets to the employer’s needs. We took a pause in part 3, to remember why it is so important to design individually around every person with disabilities and support them in finding places in the community for work. When talking about employment, it’s important we don’t forget the potential pitfalls of devaluation and abuse that can happen when we create isolated, segregated pockets of people with disabilities. Next, in part 4 we provided a link to our short and sweet e-book “6 Proven Steps to Finding a Job” – that was downloaded over 100 times in 2 weeks! We hope this was a useful glimpse at the behind-the-scenes at Starfire, and informed ways you might do similar work wherever you may be. We wanted to make sure that this guide was practical, and that we could back it with some of the stories we’ve seen as well. That’s why in part 5 we broke down how Jenny was successful at finding a job that fit her goals, using some of the same steps from our ebook. Finally, we wanted to address any questions people had around this topic, and so we gathered around a table to discuss more of the nuances of employment. For part 6, we went LIVE on Facebook, and held an open conversation on the topic for anyone to join. Now we’d love to know what questions you still have, what came up for you during this series, and what might be useful for next time. Get in touch and let us know! This past December, the Trump administration announced that they will be revoking 25 legal guidance documents that interpreted and explained a wide range of federal laws, including a guidance letter written in 2016, protecting the civil rights of people with developmental disabilities. The administration stated that these letters “improperly went beyond explaining existing laws, and instead essentially created new rules.” We don’t know quite yet what impact this will have on our work in the state of Ohio to move more disability services toward integration, but it is assuring that the existing legal framework is not impacted by the letter’s revocation. Certainly, it also doesn’t change what our mission is at Starfire. The ‘Boys’ in the Bunkhouse: Toil, abuse and endurance in the heartland. One man with developmentally disabilities was forced to work while he received chemotherapy treatment, “I threw up at my house and I threw up at work,” the article quotes him saying. Another got handcuffed to his bed at night. Another died getting lost in a snowstorm, trying to escape the only home he had. The house was so cockroach-infested it made eating an indigestible task, “many men ate with one hand over their plates to block the roaches falling from the ceiling.” They rose at 3 a.m. for work, enduring what most could not imagine for even a day, and for 3 decades of their life took home sub-minimum wages for their efforts. I read the article while pregnant with my first daughter and the images were so graphic and heartbreaking that it took me weeks to finish the story. I found myself asking again and again….How could this have happened in 2014? Almost forty years after deinstitutionalization in our country? If there is to be any consolation, the horrors these men went through informed and strengthened the call for radical changes in the disability service system across the country. The story of these men from Atalissa was the spark that brought flame to a deeper issue: the ongoing segregation of people with developmental disabilities in the workplace, home, and in day programs. While abuses like these are an anomaly, the root cause – isolation and segregation from community – was still alive and well in our country. The same year the story hit newsfeeds (one month later to be exact), the Obama administration expanded efforts to crack down on “unnecessary segregation in employment systems” for people with developmental disabilities. President Obama then took further action with an executive order to raise the minimum wage to $10.10 an hour for workers employed under certain federal contracts. The message was that people with disabilities rights are being violated, and that Congress and the nation must do more in accordance with the Americans with Disabilities Act (ADA) to support people with disabilities in the community, rather than in the forced segregation of institutions. the provision of services in the community would be a reasonable accommodation when balanced with other similarly situated individuals with disabilities. As Olmstead moved throughout the country in the form of lawsuits, a legal guidance document was written in October 2016 by the Obama administration. This is the aforementioned document that was rescinded during the announcement by Jeff Sessions. A core purpose of the ADA is to “assure equality of opportunity, full participation, independent living, and economic self-sufficiency” for individuals with disabilities. The integration mandate of Title II of the ADA is intended to allow individuals with disabilities to live integrated lives like individuals without disabilities, including by working, earning a living, and paying taxes. The civil rights of persons with disabilities, including individuals with mental illness, intellectual or developmental disabilities, or physical disabilities, are violated by unnecessary segregation in a wide variety of settings, including in segregated employment, vocational, and day programs. Of course, especially if you’ve been following our blog for years, it’s true that Starfire’s shift came before any lawsuits or pressure from the state. We were fortunate to come to our own realizations. But while others saw our transition out of day program into an integrated model as too costly, time-consuming, and radical, this clear direction in the 2016 legal guidance document from the White House and the DOJ was a beacon of support for Starfire. Perhaps the momentum toward integration has taken hold, and many programs, families, and people with disabilities are on their way out of the outdated models that segregate people in facility-based settings. Certainly, forty years after deinstitutionalization and the IDEA, almost thirty years after the ADA, and after far too many days of people’s lives spent in isolation, people with disabilities deserve an all hands on deck approach to moving each person out of institutional living and into community life. We cannot forget. Our newest story series will focus on work. What does it look like when people with disabilities are connected to meaningful employment – in the community? Listen to Christopher Kubik speak on the topic of integrated employment and ways he matches people with disabilities and employers so that they’re both the right fit. Christopher: For me personally, and I may not have enough experience to see this clearly, but I am very, very drawn to doing things that people thought were impossible. And for many people we work with their families or themselves personally were told at a young age, ‘you’ll never have a job.’ ‘You’ll never…’ A big long list of ‘you’ll never’s.’ That’s what gets me out of bed in the morning. So this summer was rough for us. A lot of people lost jobs. Because it’s their first job and you blow it on your first job. I remember being fired from the dairy corner down in Newtown. And a lot of times the people we are working with, they’re adults that have not had a real job out in the community, that has nothing to do with disability, a typical job. Maybe real is a bad name. Everyone blows their first job. You got to learn. Its okay. What do you do? Do you never work again? No. lets get another job and regroup and like go at it again now that we learned something. Were going to be able to design a better role next time. Katie: Sometimes when you hear about employment with any marginalized group, it can create this deficit umbrella over them. “Oh, they’re unemployed so that means that they’re needy in some way.” So when you go to an employer, Chris, that narrative that this is a person who has a deficit, and they need you to give them a job to make their life better. How is that a different conversation through your work? C: That’s a great question. The only reason we job hunt for people is because they have on their own said in some way, “I’m interested in that.” So we don’t prescribe a job as a solution. If you take it slow, and build it with being known first, then it can really be actually the culmination of who you are. But when it’s rushed and forced for an outcome, it can really backfire and have really long-term damage. I know personally, a job has changed my life for the better. Of who I am and what I am capable of doing. And I see that with the people we work with. Their personality changes in positive ways. They gain confidence and are more comfortable in their own skin. This is a normal thing and it’s also shockingly happening with people who live with disabilities. We shouldn’t be surprised by this. What is a job besides the money? It’s people coming together around a common mission and devoting time and energy in order to get that thing done. And so I think people should be included in that kind of thing. The second time we sang happy birthday was at the end of the night, when our cheesecakes arrived and a candle was lit. “Happy birthday dear Jessica,” the 8 women sang in chorus around her. Then for reasons all her own, Sandy reached over and lit a new candle, on another part of her cheesecake, and with all the willingness and joy that only a table of friends could muster for their friend, the queen, on her birthday, we began the third and final rendition of happy birthday to Jessica. “And many more!” Sandy concluded. “Well, because Jessica can’t drive,” I answered. Jessica’s parents both passed away 7 years ago, months apart from each other. Her mom was old, and she got sick I explained. So… she’s gone but now Jessica has other women in her life who care about her, like our family, and all the women who were around the table tonight, singing her happy birthday – 3 times. Kachelle said at first, she wasn’t sure about partnering with Danyetta – or Starfire. That was two years ago. Today, Kachelle is an active part of her community in Lower Price Hill. Through Danyetta’s support, week after week, she can now say she is building the life she imagined – filled with connections to the art world and opportunities to create with others. And because of her new friendship with Alicia, Kachelle has a job as an “artist in residence” at the neighborhood non-profit, Community Matters. Kachelle first connected to Starfire because she expressed wanting to get out of her house more and meet people her age who lived nearby. But her experiences at that time were working in a sheltered workshop, where she said she spent all of her time in the facility. Kachelle, Alicia, and Danyetta came up with the idea to create a space for artists in Lower Price Hill to engage, naming it “The Collective” – a weekly artist meet-up in Price Hill. This story is part of our Story Series, “Time.” Subscribe and get a new story from our series in your inbox every week! Being the social innovator that I am, and employing my Starfire design thinking skills, we quickly realized that if we parked the car, and walked her to the door, she no longer caused such a scene. There was still the dread of going to school, but much less abuse of the teachers. The dread however, came to stop altogether and things started to change for her when she came home excitedly about a month ago. I gave a big smile. Maggie, having no idea, that I know who Beatrice is. That she is our neighbor in Madisonville, mere blocks away from our house, and that Beatrice’s dad, Shawn, is one of Starfire’s best connectors, and Beatrice’s mom, Missy, is one of Cincinnati’s best crafting artists with Happy Groundhog Studios. I asked Shawn and Missy for permission before sharing Maggie and Beatrice’s story as we think about that budding friendship. Not because it’s extraordinary that two kids can become friends with someone who has the same purple backpack with stars. But because of the opposite side of the coin – what is lost when people with Down Syndrome, or autism, or cerebral palsy, or any disabilities, aren’t given the opportunity to feel that spark of friendship and welcome in our community. When they sharing ordinary places, when they aren’t known and given the opportunity to grow in relationship. What is lost when people with disabilities aren’t included, when separateness and isolation and anonymity are the dominant story arc of someone’s life. But Starfire tells a different story. Our work is one person at a time by design, honoring everyone’s unique identity, but it has a rich multiplying effect in our community locally and nationally. The work of Starfire is impacting more places and more lives than at any other time in our near 25 year organizational history. Our Series 3 theme is: Time. How do you want to spend your time? How does the way you spend your time impact others? When is time with others “wasted”? Katie: So, what does it mean to spend a lifetime with people? The question really is about what’s the goal. And what it means to get there. When I think about what does it mean, especially in our work in Starfire, to help people grow towards each other, it means more than just being near. The path is actually the thing we have to keep going along. We have to travel that. And time matters there it might take longer, it will take longer. We can’t actually get closer unless we spend a lot of time together. Isn’t that a great metaphor? K: Yeah. Why do people have a hard time committing to a long-haul? T: Well I’m really interested these days in what happens if we don’t have to commit to it but we just continue travel together. Because, time is just really interested in that, if we go 30 years in the future, and we say we’ve been best friends, or we’ve been married, or we’ve been great neighbors. We’d look back and say, what kinds of things did we do to keep that alive. It was things like forgive each other, and grow separately but come back together, and bring new people in to introduce and celebrate together. We’d have to do all these things that probably require us to be uncomfortable. But when we are in the future looking back, its easy to say: “Oh yeah that’s how it happened,” but it’s hard for us to see it that way. That’s why time matters so much, is that it’s the passing of time that allows all of that stuff to happen. K: Sometimes more time does not equal quality time. So with Starfire we have actually started working less with people, we spend less time with people. 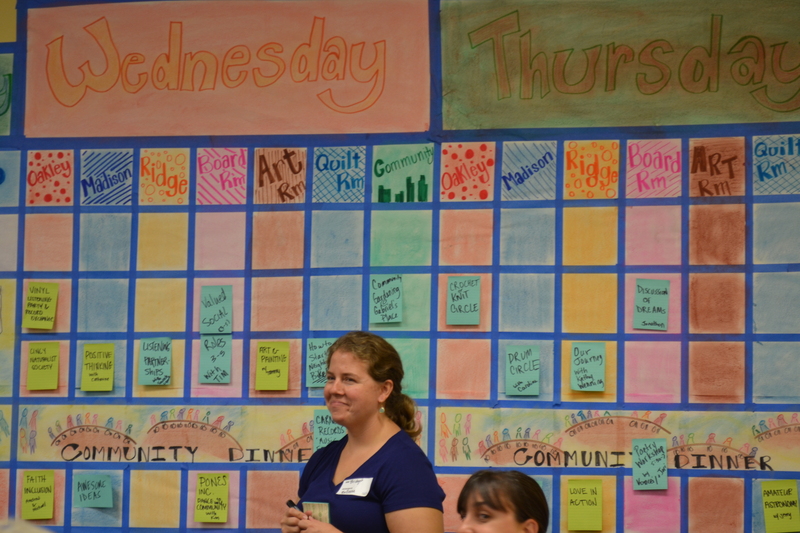 And we out in more quality during the week more than maybe we did with the day program days. T: It was just a way we thought about peoples lives and our purpose. Our whole purpose was to almost fill time, and now it is to invest it in that future story, that future goal. We have just come to understand that the time that we have with people with disabilities is sacred. It represents their life. And we spend a few hours a week building that life. A connected, vibrant, life with lots of friends who care about me. K: So you’re saying that the goal you have in mind can determine the way you spend your time. And the goal that we have is different than keeping people safe and happy now it’s a full rich life. T: Yeah, its some what of an understanding, and it’s something to own up to. We didn’t actually imagine the same kind of lives for people with disabilities than that we imagined for ourselves. And somehow we imagined that their purpose was a very finite, you know, existence. That was very much in the present of managing them or just keeping them safe and happy. When we started to say “oh we’ve been thinking about this all wrong. Each of these people have a unique purpose.” Then we had to, one come to terms how we assumed very little was possible for them. And once when we did that, we had to commit ourselves to what was possible. Then we had to understand that’s generally looks like a connected, included, participatory future. But, again its unique and wild for each person. So we had to design our services in a way that use time to get there. When we started to think about what that looks like, it takes a lifetime to build a life so we had to figure out how to invest our time and partnership with people in a sacred way that lead to that future. And allow the space for surprise and new relationships and affection to percolate. K: So that’s that three hours that we spend a week instead of the four days. T: Yup. So instead of four days its three hours of invested time, and the week in between actually really matters, because we become new over that week and the story becomes a little deeper. Week by week it gets deeper and deeper. Its approaches that vision of the future. It approaches that forty to fifty-year story. You can only chip away at that a step at a time, or a day at a time week at a time, you can’t knock it all out in a week or a month. It just doesn’t work like that. …Also, please save the date for our Giving Tuesday at the end of this month!